The juried mainland art show held in Jackson, Wyo. is hosted by Teton Home and Living magazine. It is the pinnacle for high-end Western art, furniture and fashion. With only two awards being given in the Home Accents category, this was a huge honor for Hoist, who has worked with palm fiber material for more than 13 years. Surrounded by more than 115 other exhibitors, Hoist said it was a privilege to present her contemporary designs, inspired by tropical materials and Hawaii’s rich paniolo culture. 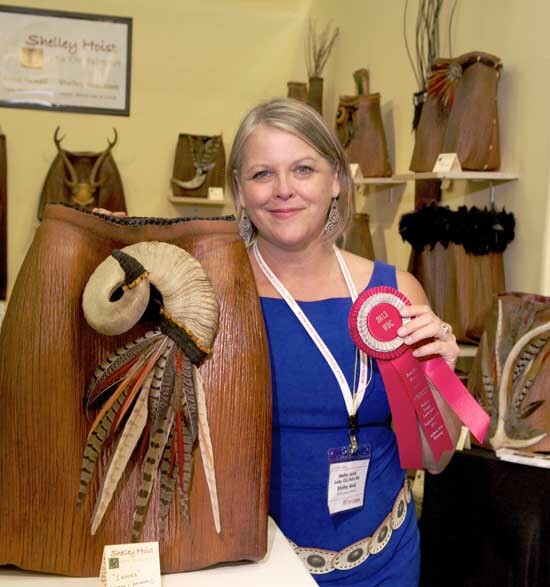 “Ikaika” has also garnered Shelley another prestigious honor as a finalist in the 2014 NICHE Awards, in the basketry category. Sponsored by NICHE magazine, the NICHE Awards program began in 1989 to celebrate excellence and innovation in American and Canadian fine craft. Nearly 2,000 entries are received each year from professional and student craft artists from across the U.S. and Canada. Each year, a prestigious panel of judges is selected by the editors of NICHE magazine, including gallery owners, guild and museum directors, curators, craft industry experts and arts advocates. After the judging process is complete, and counts are tallied, the top-scoring pieces — five in each category — become NICHE finalists. Out of these five, the highest-scoring piece in each category wins the NICHE award. The NICHE Awards ceremony takes place each January during the American Made Show in Baltimore, Md. The winners are revealed at the ceremony and receive a trophy. “Ikaika” was created from a giant, natural colored Alexander Palm sheath that was stitched with waxed linen and lined with Dupionni silk. A local hunter’s special find of a wild, mature mouflon sheep horn was adorned with deer skin and amber chips. Duck, ringneck and golden pheasant feathers complete the piece which was purchased by a collector in Wyoming. Palm fiber often resembles leather or wood and her pieces bring texture and warmth to many types of decor. For a private studio showing, call Hoist at 937-1774.